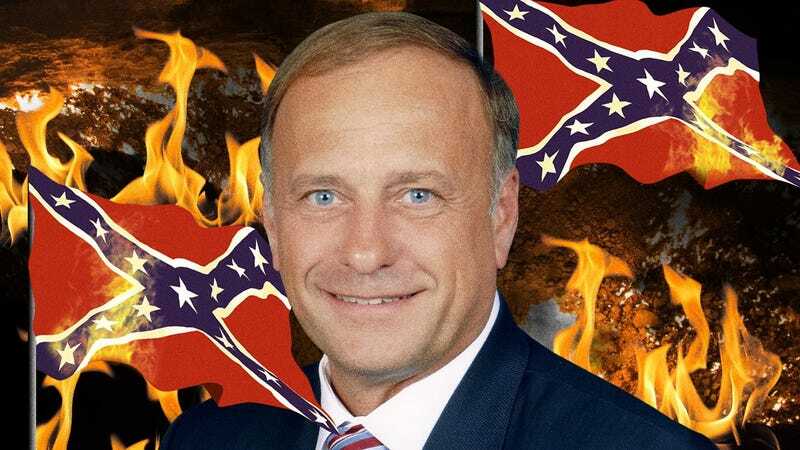 Vice.com depicted Rep. Steve King (R-Iowa) surrounded by burning Confederate battle flags. King has been photographed with Confederate symbols that were part of a flag display on his desk. Rep. Steve King, R-Iowa, must go, two of his home-state newspapers say. King tweeted over the weekend, “We can’t restore our civilization with somebody else’s babies” and predicted Monday that blacks and Hispanics “will be fighting each other” before overtaking whites in the U.S. population. King’s “rampant racism is an opportunity for Iowa Republicans and the party at large. Exorcise the nationalist bent before it’s too late,” the Quad-City Times editorial board wrote on Wednesday. The Des Moines Register wrote on Monday, “If King’s world view truly doesn’t match that of the Republican Party, then party leaders at both the state and national level need to stand together in supporting an opposing candidate in the 2018 Republican primary. Given King’s longstanding record as one of the least effective members of Congress, the GOP should have no difficulty finding a more thoughtful and qualified individual to represent the people of Iowa’s 4th District. Wilders’ party was beaten soundly by that of Dutch Prime Minister Mark Rutte on Wednesday. On Tuesday, Chris Massie reported for CNN, King “was on the radio responding to a question about Univision anchor Jorge Ramos’ comment to Tucker Carlson on Fox News that whites would become a majority-minority demographic in America by 2044, a point Ramos used to make the argument that it is a multiracial country. “The Trump administration’s efforts to rewrite the rules for media coverage reached a furious peak on Wednesday as veteran State Department reporters expressed outrage over Secretary Rex Tillerson’s decision to take only a reporter from a conservative website on his first trip to Asia,” Hadas Gold reported Wednesday for Politico. “Tillerson’s move caught most of the media off guard, in part because he has more to gain than lose by courting the diplomatic press corps, which has enjoyed generally good relations with all secretaries of state going back to the Reagan administration. Indeed, of all the branches of the Washington press corps, the State Department’s is widely considered the most staid and serious, the type who actually care about policy versus palace intrigue. “But those same reporters are now furious, frustrated and, in some cases, disgusted by what’s been deemed a violation of tradition and a public trust, with Tillerson’s decision to bring only Erin McPike of Independent Journal Review, a conservative news outlet which made its name with lighthearted videos featuring politicians and viral stories. “Incredibly, especially for those of us who called him our friend, 25 years have passed since the murder of fearless journalist Manuel de Dios Unanue, at a Spanish restaurant in New York City,” Albor Ruiz wrote Tuesday for Al Día in Philadelphia. “The courage to expose Colombian drug capos and their poisonous presence in his city, cost him his life. “ ‘No one can tell me what I can’t write,’ the tall, thin, intense Unanue would answer those who would warn him about the risk to his life. He was well aware it was a dangerous business. But the Cuban-born journalist was not willing to compromise. “ ‘It seems to me he laid down his life for all society,’ John Cardinal O’Connor told the 1,500 people who attended an emotional memorial service at St. Patrick’s Cathedral a few days later. “President Trump compared his presidency to that of Andrew Jackson while marking the birthday of the nation’s seventh president on Wednesday,” Mallory Shelbourne reported Wednesday for the Hill. Rashida Jones, who joined MSNBC in 2013 from WIS-TV, where she was news director, has been upped to SVP of specials for the combined NBC News and MSNBC,” Chris Ariens reported Wednesday for TVNewser. “ESPN’s last big round of layoffs took place in 2015 and stayed, for the most part, behind the camera,” Daniel Holloway reported Wednesday for Variety. “Its next round won’t be so deferential to talent. “The Disney-owned cable channel is set to reduce personnel in the coming months, with the bulk of cuts coming from the on-air ranks. The move is indicative of the growing pressure ESPN feels as the cable ecosystem evolves, and of how the network plans to adapt in response. Holloway also wrote, “ESPN has shifted its talent priorities in the last two years. Gone are old, high-priced hands such as Chris Berman, Keith Olbermann, and Bill Simmons. Among the channel’s rising stars are Scott Van Pelt, who began hosting a special late-night version of ‘SportsCenter’ in 2015; Michael Smith and Jemele Hill, who launched their own specially branded 6 p.m. ‘SportsCenter’ last year; and ‘Mike and Mike’ co-host Mike Greenberg, [whom] the network is eyeing for a possible solo morning show. “All four represent a type of personality that ESPN will value in the coming reorganization — they appeal to young or traditionally underserved audiences and are able to move seamlessly between television and digital. The Association of Latino Professionals for America listed “The 50 Most Powerful Latinas of 2017" in Fortune magazine on Wednesday. Included are Cynthia Hudson, senior vice president and general manager of CNN en Español and Hispanic strategy for CNN/U.S. ; Claudia Puig, senior vice president and general manager of local media, Univision Communications Inc.; and Monica Lozano, former CEO of La Opinión and ImpreMedia. The African American Public Radio Consortium, which brought to NPR “The Tavis Smiley Show” and “Tell Me More,” is offering stations a musical, career-long, three-decade look at Gladys Knight and the Pips, narrated by Bubba Knight, a member of the group and Gladys’ older brother. Journal-isms readers may listen to the two-hour show free of charge by downloading the MP3s here. The production was conceived by KCEP-FM in Las Vegas in partnership with the consortium, Loretta Rucker, consortium executive director, told Journal-isms by email. It has aired in Atlanta; Alcorn, Miss. ; Greensboro, N.C. ; Prairie View, Texas; Las Vegas; Jerome, Ariz.; Shreveport, La. ; and Gualala, Calif. “Both the producer and the AAPRC are interested in sharing this with any station that requests it,” Rucker said. She may be reached at lerucker (at) aol.com. “Gordon David Regguinti passed on to the spirit world on February 2, 2017,” Mark Anthony Rolo wrote Tuesday for the Circle News, a Native American publication based in St. Paul, Minn. “He was 62. Rolo also wrote, “Karen Lincoln Michel (Ho-Chunk), who served as NAJA’s president, said Regguinti was instrumental in shaping the vision for the organization,” referring to the Native American Journalists Association. “Regguinti’s work with NAJA included securing major foundation grants to underwrite training workshops for emerging Native journalists. He used his position to lobby mainstream news organizations to open their doors and hire more Native people. And he was aggressive in educating Indian Country about the importance of a free tribal press. Ernest J. Wilson III, dean of the USC Annenberg School for Communication and Journalism since 2007, is stepping down and will be succeeded on July 1 by Willow Bay, the school’s director, Dominic Patten reported Monday for Deadline Hollywood. Bay is a former “Good Morning America Sunday” anchor and has also worked for CNN, NBC, the Huffington Post and Bloomberg. She would be the school’s first female dean. Wilson, who is also Walter Annenberg Chair in Communication and professor of political science, did not respond to inquiries. “FCC Chairman Ajit Pai said that the agency is studying restrictions on media ownership, characterizing a number of the rules as ‘quite antiquated’ . . . ,” Ted Johnson reported Tuesday for Variety. In 2015, Texas Department of Public Safety trooper Brian Encinia pulled over Sandra Bland, a black woman, “for failing to use a turn signal and arrested her. Bland was found dead in her Waller County jail cell three days later,” the Star-Telegram in Fort Worth, Texas, recalled March 3 in endorsing a bill known as the Sandra Bland Act. The bill, sponsored by State Rep. Garnet Coleman, D-Houston, “breaks down into two major parts: racial profiling and the diversion of a person suffering from mental health issues or substance use disorder. . . .” However, it is given little chance in the Republican-controlled legislature. Adriana Diaz, a CBS News correspondent in Beijing, is returning to the United States as a correspondent in Chicago, CBS News President David Rhodes announced on Monday, Lisa de Moraes reported for Deadline Hollywood. Diaz, a digital journalist, is proficient in Mandarin, “nearly fluent” in French and in Spanish, “nearly bilingual,” according to her LinkedIn profile. “WAMU in Washington, D.C., expected a drop-off in audience and station carriage when it introduced a new national program to succeed the long-running The Diane Rehm Show in January,” Tyler Falk reported Monday for current.org. “It’s ‘the natural thing that happens in a transition,’ said JJ Yore, WAMU’s GM. But after two months on the air, 1A is exceeding expectations for station carriage. . . .” “1A” is hosted by Joshua Johnson, formerly newscaster and podcast host at KQED-FM in San Francisco. Carla Hinton, religion editor at the Oklahoman since 2002 and the Tulsa Association of Black Journalists’ 2009 Journalist of the Year, and Paul R. Lehman, the first African-American newsperson on Oklahoma City television and the first black professor at the University of Central Oklahoma, are to be among nine journalists inducted into the Oklahoma Journalism Hall of Fame on April 27, the Tulsa World reported Wednesday. “On the eve of International Women’s Day, Reporters Without Borders (RSF) is proud to announce the opening of Afghanistan’s first center for the protection of women journalists,” the press freedom organization announced on March 7. In Britain, “TV writers and producers have threatened to boycott plans to measure diversity on television after broadcasters refused to reveal which shows had the worst record for employing people from black, Asian and minority ethnic backgrounds,” Tara Conlan reported Friday for the Guardian. — Dorothy Gilliam, veteran journalist, 19-year Washington Post columnist; former president, National Association of Black Journalists; co-founder, Maynard Institute for Journalism Education.